A summit between the European Union and Russia has ended without progress on a new partnership agreement with Moscow. The two sides had planned to launch negotiations on such a pact - involving energy, migration and other issues - in the Finnish capital Helsinki. But Poland vetoed the partnership talks and is refusing to lift its objections unless Russia ends a ban on imports of Polish meat. Most EU members had tried to get Poland to change its mind, to no avail. The BBC's Jonny Dymond in Helsinki said the summit appeared to be doomed to failure before it had even begun. It is the first time that one of the 10 countries that joined the EU in 2004 has blocked such an important EU agreement. Talks about a new Stability and Co-operation Pact between the EU and Russia were to have been a key part of the meeting. Despite nearly two weeks of lobbying from the other 24 members of the EU, Poland refused to set aside its objections to the Russian boycott of its meat. 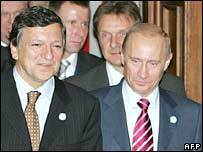 European Commission President Jose Manuel Barroso said at a joint news conference after the summit that there were "no technical grounds" for the Russian ban. Russian President Vladimir Putin blamed Poland for the situation, saying Polish officials were unwilling to properly supervise other countries' meat products transiting through Poland. He threatened a new ban on all EU meat products from January when Romania and Bulgaria join the bloc. The EU said on Friday its experts would go to Moscow next week to explain EU food safety measures to calm Russia's concerns. "It's a question of import of meat that without any doubt will be resolved," EU foreign policy chief Javier Solana said. Because of persistent outbreaks of swine fever in Romania and, to a lesser extent, Bulgaria, the EU has already banned exports of live pigs and pork products from both countries until next October at least. Dozens of slaughterhouses and dairies are also barred from selling abroad. At the news conference, President Putin said Moscow would be "patient" and would wait for an agreed position by the EU on the partnership agreement to replace a 1997 deal. Mr Barroso said the deal would be signed "as soon as possible" and there should be "no legal vacuum" until this is done. Officials from both sides have said the existing agreement, which expires at the end of the year, could be extended as required. Russia and the EU also discussed a number of other issues, including Iran, the Middle East, North Korea and energy policy. EU officials said they had ended a long-standing dispute with Russia over the phased withdrawal of taxes on Asia-bound flights across Siberia - one of the hurdles to Moscow's accession to the World Trade Organization (WTO). But Russia repeated its position that it would not ratify an energy charter that would grant foreign companies indiscriminately access to its energy reserves. It said it was prepared to include some charter provisions in a future partnership deal with the EU. 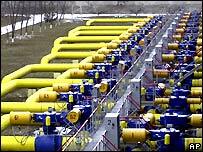 Europe is worried about its dependence on Russian energy. About 30% of its gas comes from Russia. In January Russia briefly cut the gas supply to Ukraine, in a dispute over prices, sending a shockwave through the whole of the EU.